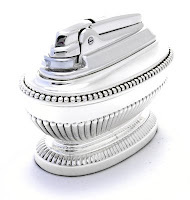 Ronson Queen Anne was probably the best selling table lighter in the world. It was manufactured since the late '30s - first as a wick lighter than in the '60s the design was changed and the Varaflame fitment with fingertip flame adjustment was introduced. This described butane lighter was manufactured for approx 20 years from 1961 to 1980 only in England. This was one of only few table lighters which despite of rapid changing trends kept its XVIII century Anglican style. The base of the lighter is made from a heavy metal covered by a thick layer of silver. The base is padded with green felt and the silver plate is protected by a transparent lacquer which often is partly deteriorated (spots, white, yellow or brown tint). The lighter insert – Ronson Varaflame – is chrome-plated, unfortunately, not as durable as the wick lighter (no gas leaks etc.). The Queen Anne was also available in gold-color finish. And it was also manufactured in the U.S. I'm preparing an eBay listing right now for my never used lighter, probably vintage 1965, and would be glad to send you an URL to my eBay working folder. I have a Ronson Queen Anne table lighter how much does the box, instructions and tagged increase the value?